The ground expansion plug offers the greatest level of holding power or leak resistance available in an expansion plug. The ground edge provides maximum contact surface area and finest surface finish. To maximize effect, the counter bore should receive special finishing. Ground Plugs, installed in a correctly prepared counter bore, should eliminate the need for sealer and should hold highly penetrating liquids. While their cost is higher than standard Hubbard Plugs, they are less expensive than pipe plugs or other closures when considering the total cost including tapping. We grind the edge circumferentially to a high finish, and segregate the parts when packing to prevent damage to the edge during shipment. For greatest protection ground edge Hubbard Plugs should be kept in their packing containers up to the point of assembly. We have found 1” diameter .083” thick steel ground plugs to hold 1,600 lbs of pressure before failure, which is between 10 and 20 times the holding power of a standard blanked edge plugs. The effective use range should be less than that. Steel: SAE1008/1010 low carbon steel: ASTM#A109 or A569 depending on gage. * These are materials we stock in various thicknesses. It does not mean we have finished inventory of all plugs in each of these materials. ** Customer specific materials different than those listed above are commonly run. “d” Hole = Plug upper limit +.002”, more clearance may be needed for plugs over 2.5”. Depth = 1-1/2 to 2 material thicknesses (1 material thickness minimum). 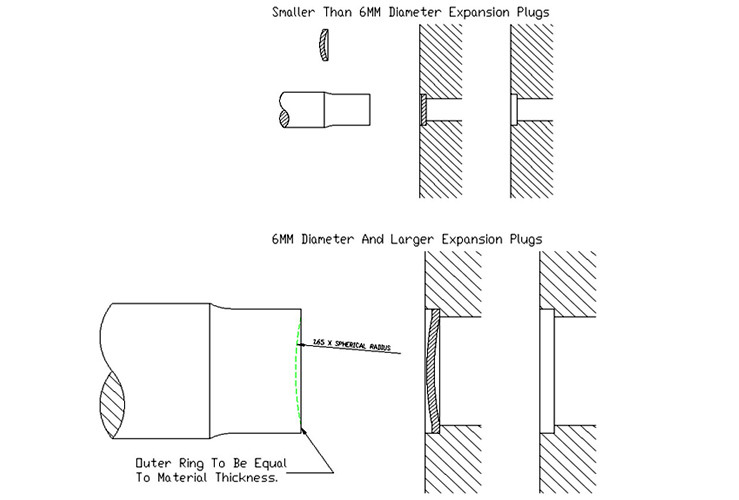 The counter bore should be of a diameter that will take the plug without forcing, no larger. Typically this means .002” larger than the maximum plug diameter, although more clearance than .002” should be given to larger diameter plugs. If the plug is forced or press fit in the hole prior to expansion, the edge of the plug and the edge of the hole are apt to become marred, and leakage will occur. The counter bore should be round and free of tool chatter marks. 100 micro inches or smoother is a good finish guideline. The counter bore should be finished without any fillet. A fillet can prevent the proper seating of the plug. The counter boring tool should dwell long enough at the bottom of the counter bore to leave the bottom clean and smooth. The sharper the corner, the better the seal. The counter bore should be at least the depth of the material thickness of the plug to be installed. For the best condition, the width of the bottom of the counter bore should be approximately equal to the thickness of the plug to be used. For best results, the angle between the cylindrical sides and the bottom of the counter bore should be 95 to 97 degrees. This allows the plug to turn inside out slightly, and then spring back to an almost flat position – providing maximum sealing quality. NOTE: The above hole configurations are for optimal sealing. Flat bottomed counter bores with varying shoulder widths are used for general sealing – applications with no liquid retention or pressure requirements. Optimal installations require a consistently perpendicular installation tool and possible calibration of installation forces. The goal should be an installed plug that is visually flat. We have traditionally advised “If only a few plugs are to be installed, the best tool for setting them is a short piece of cold drawn shafting 8 or 10 inches long and of a diameter slightly less than the diameter of the plug to be set. By placing it perpendicularly over the plug, and striking the shafting one or two blows with a fairly heavy hammer, the plug can be set down sufficiently to not quite a flat position”. 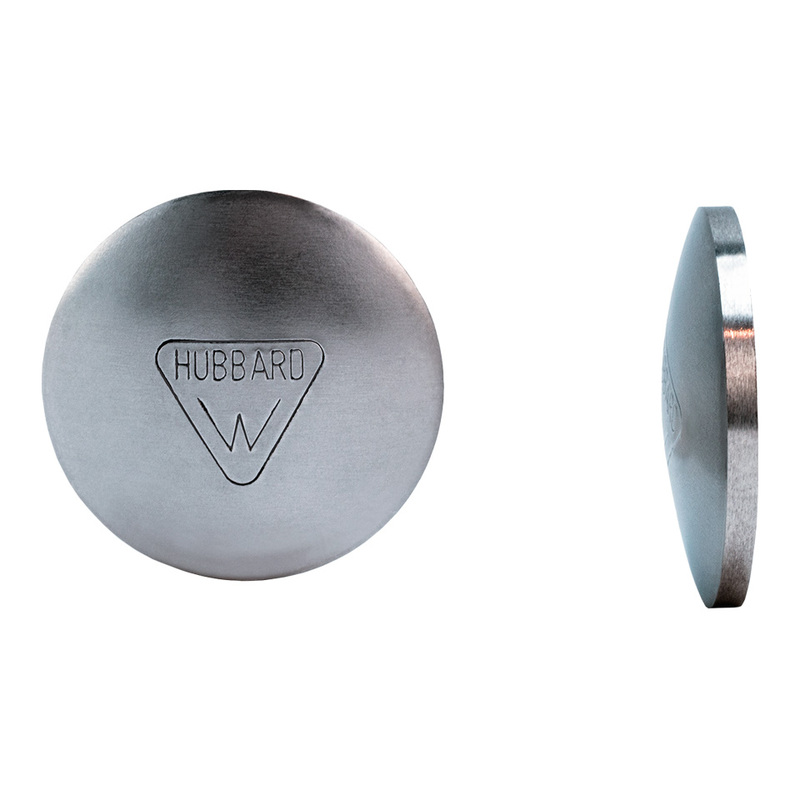 Sealant is used in more severe applications, but this can be eliminated with the use of Hubbard Ground Plugs. The edges of an installed plug can be staked to improve general retention. The outside diameter (d) and spherical radius (r) of our metric plugs conforms to DIN 470 with no exceptions. We offer many stock thicknesses and grades of material for each of these diameters – these stock grades and thicknesses do not always conform exactly to DIN 470. The stock material grades we offer are listed under the “More Information” tab on this catalog page. The stock material thicknesses that relate to each of these materials can be found by going through the RFQ process for a particular diameter of plug. We can quote metric plugs with thicknesses that conform to DIN470 – however if you can work with our stock material the piece price will be more economical, especially for small and medium volume orders.